While still in New York, Joni had been offered recording contracts with Vanguard and several other labels but none of them offered terms she cared to work under. She and Elliott Roberts had decided to turn them all down. Roberts had followed her to L.A. and Joni signed a contract with Warner Brothers' Reprise label which granted her the rare stipulation of creative control. 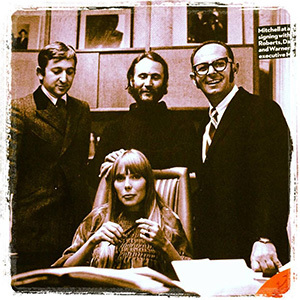 Nevertheless, David Crosby had the foresight to offer his services as producer of Joni's first LP. The record company felt confident that Crosby would put the right folk-rock spin on the record to make it marketable. But David knew that the pure intimacy of Joni's music would be defiled by any hackneyed attempt to make it sound commercially viable. He made the wise decision to let the artist's talent speak for itself. With the exception of Steven Stills' bass and a touch of piano on one track, Joni's voice and guitar were the sole instruments recorded on her first album, 1968's 'Song To A Seagull'. David Crosby has said that the one bit of production he contributed to 'Song To A Seagull' was to stand Joni next to an open grand piano and record the reverberation of the piano strings as she sang. Unfortunately, either David lacked enough expertise to produce a well-recorded album or something happened to the master tapes that affected the sound of the finished record. In spite of the lack of clarity, the record has a haunting sound to it. The voice sounds like it is coming from another room just down the hallway of a large old house, a room that might be mysteriously empty and silent if the listener should go looking for the source of the ethereal sound. Joni wrote all of the ten songs on 'Song To A Seagull'. Each one displays the refinement and development of her musical genius and writing ability. The first delicate guitar pickings of the opener, 'I Had A King', are the beginning of nearly 40 minutes of music that has a strange beauty infused with an echo of a deep longing. It creates an impression that will continue to haunt the memory long after the first hearing. The woman who had spent many days in bed at a young age, enduring painful rehabilitation as the result of a deadly disease was giving voice to the introspective nature that her illness had generated in her. The damage that polio had inflicted on her hand had also caused her to develop the use of alternate guitar tunings into her own musical innovation. Eventually she would create more than 50 different tunings, enabling her to play chords that would be next to impossible to play on a standardly tuned guitar. On 'Song To A Seagull', the movements of the melodies from one note to the next are remarkable in their inventiveness. Unusual key shifts and distinctive chord structures catch the ear. The lyrics are beautifully constructed and so vivid that the songs repeatedly create visual images in the mind's eye. Joni had honed her writing skills and was using words to create highly original verbal paintings. Melody and lyrics are inextricably linked, creating nearly perfect marriages of music and words. Joni's first medium of artistic expression is also evidenced in the design of the record's gatefold jacket. The cover art for 'Song To A Seagull' is an intricate pen and ink drawing. If one opens the gatefold the drawing reveals a fantastical combination, partially filled in with vivid colors. There is the outline of a woman's profile on the front. She wears an elaborately detailed garment and a headdress over swirls of yellow hair. Above and to the left of this figure are depictions of birds, flowers, a butterfly. A cactus appears in the upper right corner of the back half of the jacket. On the front, set into the woman's headress is a small round photo of Joni Mitchell standing in a narrow, gritty looking urban street. She carries a guitar case and an open umbrella. A larger version of this photographic image, taken from a different camera angle, fills most of the back of the album cover. In the lower righthand corner of the front sleeve is an uncolored drawing of a sailboat on an open sea. Behind the boat, the sun sits on the water's horizon with lines of rays emanating from it. A swarm of V-shaped lines, curved to depict the wings of seagulls, winds its way up from the sailboat. In the upper right corner, they are grouped to form letters, spelling out the record's title. There is a distinctly flower childish feel to this artwork that is very much in keeping with the time of 'Song To A Seagull's release. The love of painting and drawing that had absorbed Joni in childhood has never waned. Her visual art appears on many of her record covers. The development and increasing sophistication of her artwork over the course of her career can be seen as a parallel to the ongoing growth of her musical output. ...is a musical representation of the break up of her marriage, rendered from her artistic point of view. 'Cactus Tree', the final track of the record introduces a theme that would thread its way through most of Joni's musical output. The lyrics paint a picture of several different men who are in love with the same woman. Although this woman feels love for all of these men, a radical concept in 1968, ultimately her need for autonomy will not allow her to bind herself to any one of them. Although she would make only a few veiled references to it, the pain and sense of loss caused by the separation from her baby would embed itself in the recesses of her music for many years to come. It was nearly impossible to separate the art from the artist. When the talent of the artist is of a caliber as high as that of Joni Mitchell's, this attribute creates a powerful magnetism. The many listeners that connected with this music, finding that it spoke to their own emotional core, developed an intense and enduring loyalty to Joni Mitchell. 'Song To A Seagull' is the first in a line of recordings that has stretched over nearly 40 years. Joni Mitchell has produced 16 albums that are made up mostly of songs that are entirely her own creations. Her name is listed as the sole producer of most of these records. She has also released two recordings of live performances, a collaboration with one of the great musician/composers of modern jazz, several compilations of songs collected from previous albums and an album of pop standards. All in all there are 27 different titles in her catalogue. Her restless, creative spirit has never allowed her music to remain static. She has explored many different types of music and incorporated them into what can only be described as her own unique genre. Arrived in Ottawa. - Beautiful hotel...Strange people...Beautiful dinner Talked with Joni Mitchell on the phone...I think I'll record her tonight with my excellent tape recorder (knock on wood) Hmm...can't find any wood...everything's plastic. Beautiful view. Marvelous sound on first show. Good on 2nd. Good recording. Went down to the little club to see Joni - fantastic girl with heaven words. We all go to party - O.K. Millions of girls - listen to tapes and smoked back at hotel. We left Ottawa City today - I kissed Joni goodbye, slept in the car awhile - stopped at a highway diner - I mean a _Real_ one.. like in the movies. Mitch and I discuss our plans for movie. Slight disagreement here and there but it will be soon straighten out. Nothing happened in Rochester tonight. Went to a very bad bad bad tasting restaurant. Thugs follow us. They probably was scared. Couldn't figure us out. Me with my Indian hat and Mexican moustach, Mitch with his fairy tale jacket and Noel with his leopard band hat and glasses and hair and accent....G'nite all. Joni made another new acquaintance while she was in Ottawa during this time. 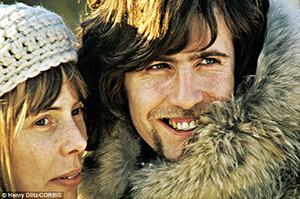 She was introduced to Graham Nash who was part of the English rock band 'The Hollies'. Graham had become friends with David Crosby who had told him about Joni. In the summer of 1968 Joni was booked into two legendary venues. In June she played twelve shows at The Troubadour in Los Angeles. In late June and early July she played seventeen dates at New York's The Bitter End. On February 1, 1969 she played a concert at Carnegie Hall. She accompanied herself on guitar and performed songs from 'Song to a Seagull' as well as new songs that would appear on her next album. Joni also appeared on US television during 1969 and 1970. She was was featured along with John Sebastian and Mary Travers on 'The Mama Cass Television Program', taped in January of 1969 and broadcast in April. Joni was also a guest on three episodes of 'The Johnny Cash Show', two broadcast in the summer of 1969 and the third in the autumn of 1970. Joni's second album 'Clouds', released in 1969 is another collection of original guitar based songs. The vocals were recorded without any atmospheric effect and her singing sounds much more natural and down to earth. She recorded her own version of 'Both Sides Now' for 'Clouds'. The album also contains another of Joni's songs that Judy Collins had recorded. 'Chelsea Morning', inspired by the period of time Joni lived in the Chelsea district of NYC is an upbeat, joyous addition to the strong collection of songs that make up 'Clouds'. Barbra Streisand recorded another one of the songs Joni wrote for 'Clouds' on her 1971 album 'Stoney End'. Her performance of Joni's 'I Don't Know Where I Stand' is restrained and heartfelt. It brings out the beauty of the melody and the instrospective nature of the lyrics as they examine the emotions of hope and insecurity experienced in the first stages of romantic attraction. 'That Song About the Midway' is about a charismatic man that the singer spots on a carnival midway 'playing on a guitar strings'. She likens him to a 'devil wearing wings' as he plays with his guitar and later, a pair of dice which he shakes while 'betting on some lover'. Bonnie Raitt would record a sultry cover of this particular song on her 1974 album 'Streetlights'. The cover art for 'Clouds' is a gouache, realistic, self-portrait. It depicts Joni holding an open red flower up to her face with a landscape showing the South Saskatchewan River in the background. To the right of Joni's face, part of the city of Saskatoon is depicted, dominated by an image of the Bessborough Hotel. This is a contrast to the fanciful drawings of the 'Song to a Seagull' album art and can be seen as a measurement of the development of Joni's visual art. Apparently the knuckle rapping instructor from her childhood had not killed Joni's ability to play piano as evidenced on her third studio album, 1970's 'Ladies of the Canyon'. Piano and guitar, accentuated with vocal overdubs provide beautiful settings for the unique melodic lines and finely wrought lyrics that Joni created for the songs that comprise 'Ladies of the Canyon'. By this time Joni had settled into the Laurel Canyon district of Los Angeles and you can practically feel the southern California sun pouring through the title track of 'Ladies of the Canyon'. For musicians, Laurel Canyon in the 1970s was similar to what London's Bloomsbury neighborhood was for writers and artists in the early years of the 20th century. Laurel Canyon had developed into a colony of musicians who would greatly influence the sound of American popular music throughout the 70s and beyond. 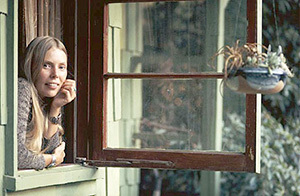 Joni had purchased a house on Lookout Mountain Avenue and was sharing it with Graham Nash. She had met Graham in Ottawa shortly after 'Song To A Seagull' had been recorded. After discovering an undeniably potent musical chemistry between himself, Stephen Stills and David Crosby, Nash broke off from the British band The Hollies and came to California to form Crosby, Stills and Nash. After an amicable breakup with David Crosby, Joni became seriously involved with Graham. 'Willy' from 'Ladies of the Canyon' was written about Graham. 'Our House' from Crosby, Stills, Nash and Young's 'Deja Vu' was Graham's idyllic musical description of the life he and Joni shared in Laurel Canyon. 'Ladies of the Canyon' also included the ecologically themed 'Big Yellow Taxi', a song that has been covered by numerous artists. As late as 2003 the band Counting Crows recorded a version of this song that went to 42 on the Billboard Hot 100 and to number 5 on both Billboard's Adult Contemporary and Adult Pop charts. 'Big Yellow Taxi' and the song 'Conversation' showcase the increasingly complex rhythmic structures that were developing in Joni's music. ...gives a hint that the song may a be a wistful look at what might have been. Perhaps the lyrics are an imagined scene between Joni and her daughter. The seasons were slipping rapidly by in their constant revolutions and the small and large incidents in her child's life that make invaluable memories for a parent were playing themselves out somewhere outside of Joni's life. Joni and Graham Nash lived together in the Bohemian urban rusticity of Laurel Canyon for two years and from everything that both of them have said about their relationship, they were deeply in love. Graham wanted the couple to marry and Joni seemed inclined to accept his proposal. This article has been viewed 17,823 times since being added on May 16, 2014.